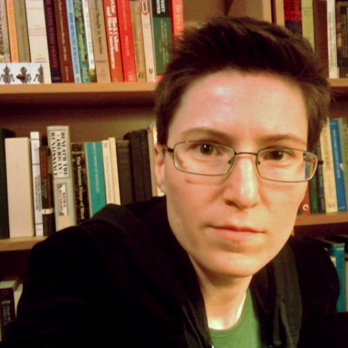 What players are learning: Careful calculation is key to a profitable settlement, but boredom, intrusive attempts at monetization, and a ludicrous pricing scheme quickly make playing The Settlers Online feel like a chore. Step back in time and rule your own medieval empire... or something like that. That's roughly the premise behind The Settlers Online (TSO), but don't expect a masterpiece of historical accuracy here. Settlers is an old franchise that first debuted on the Commodore Amiga in 1993 and has since spawned over a dozen sequels and re-releases. Tongue-in-cheek humor and a slow-paced style of resource-gathering and economic micromanagement are the predominant characteristic of the series, but German developers Ubisoft Blue Byte really test the limits of players' patience in this browser-based reboot. The game is graphically pleasing and impressively complex for a free-to-play browser game, but unfortunately, it plays more like an endurance test than an enjoyable diversion. Cobblestone roads really spruce up the industrial sector. I first discovered this game on a recommendation. It was described to me as a game that doesn't bear the stamp of being an "educational game," but which nonetheless has valuable teaching and learning components. Particularly, the game requires considerable calculation of ratios in order to optimize production chains and to profit off the in-game trading system. Although beginning players will probably not fully appreciate these complexities, players dedicated enough to advance past level 25 or so will definitely find themselves crunching a fair amount of numbers in order to chart the most profitable course to the next level. Few games require as much use of spreadsheets, online calculators, and account ledgers as TSO does, and in this respect, the game does have a lot to offer the mathematically-minded and logistics-lovers. But the downside is that careful planning and calculation are only part of the story. Players who aren't willing to shell out real-world money will find the pace of progression through the game to be excruciatingly slow. Resources accumulate at a snail's pace (some resources take a minimum of half an hour or more for a single resource to be produced), and buildings can take upwards of a week to build and upgrade. But this isn't simply a game that you can "set and forget." Players have to check in at least once a day, if not more often, in order to keep their economies running smoothly. And this is where the game ultimately falls flat. You simply can't expect to play TSO on your time; you have to play the game on its timetable, or else pay the price. 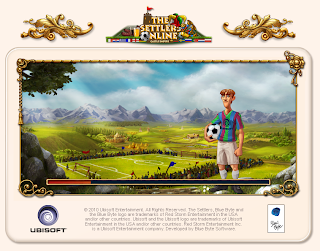 On the surface, The Settlers Online is a fairly conventional city-building simulator. Players start the game looking down from their God's-eye view at a modest Mayor's house and a small patch of land surrounded by impenetrable clouds. 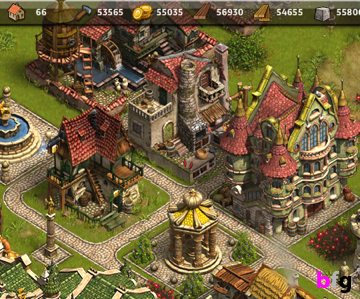 Tutorial quests instruct players in how to invest their scant starting resources into creating new buildings. Those new buildings create new resources, and new resources enable more building and expansion. You may notice that there's a pattern here. Everything in the game is structured around spending one set of resources to buy some other kind of resource. No matter how much your city grows, the thirst for resources continues: mines collapse and need to be rebuilt, fisheries run out of fish and need to be restocked, soldiers die in battle and take their weapons and recruitment costs with them. In the world of Settlers, there is no such thing as a self-sustaining ecosystem. You must babysit your settlement every step along the way. The scarcity of resources seems to serve two functions in the game. First, it is a pretty transparent attempt to get players to spend real world dollars or euros on buying gem packages. Gems can be used in the game to (temporarily) shorten production times, buy more resources which can be instantly added to your storage, and even to acquire some buildings and personnel that cannot be otherwise produced in-game. This gives paying players certain distinct advantages over the free-to-play folks, but because players don't yet directly compete with one another in the game, the benefits to gem-buying players are limited. However, the existence of gem-bought items in the Settler's economy does have some negative effects for all players, but I'll get to that a little bit later. Being rich and bored is an age-old formula for disaster. The second, less obvious, function of scarcity in TSO is to add an element of challenge to the game. I had to the opportunity to play the game on the test servers, where players are provided with a fully upgraded settlement and a huge amount of resources and gems. While most of my time on my normal account was spent eagerly and impatiently waiting for resources to accumulate so that I could spend them on something else, when I had an abundance of resources on the test server, I found myself with no idea of what to do with them. Suddenly, the lack of purpose to the game became glaringly obvious. The primary mechanic of gameplay is about deciding how to spend resources. The scarcity of resources in a normal game makes that decision-making feel important. Having an abundance of resources, however, makes you realize just how uninteresting a decision it really is. When you've run out of things to buy, there really isn't anything to do anymore. Although the game does have combat and conquest elements to it, these also function primarily to create scarcity. Players invest food, weapons, housing structures, and time into building up an army. They then send their troops to attack enemy camps, and invisible calculators determine just how many of those troops to remove from a player's economy. It's a rather inscrutable system, and players who want the best chance of success will need to turn to external websites for combat calculators. Nothing to see here, folks. Seriously. Players have no idea what goes on in battle. When you start to understand how combat works, you see that it's a system that's stacked against the player in a number of ways. 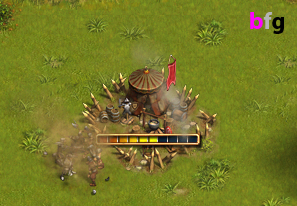 For example, scaling up the number of units you send won't always change the outcome of a battle. 20 Recruits (your guys) matched up against 20 Scavengers (the bad guys) will result in a win for the player, but you'll lose a minimum of 12 Recruits, and possibly as many as 18 Recruits, or 90% of your initial army. Bump the number of Recruits you send into battle up to 30 and you reduce your losses to a more reasonable 9-13 Recruits. Better odds for sure, but what happens if you want to annihilate the other army and suffer the least amount of losses? You can't. Sending in 50 Recruits will diminish your losses to a range of 7-10 units. Send in 100 Recruits? Still 7-10 units lost. Send in 200 Recruits against those same 20 Scavengers? You guessed it: still 7-10 units lost. The system is designed to make sure that troops are destroyed in almost every battle, although players won't know this without consulting outside guides. They also won't know that the real strategy behind combat in Settlers is not about winning every battle, but about minimizing the amount of resources lost over an entire campaign. The Gem Pit, aka, the Money Pit. The one resource that is the most vital to success in TSO, which is also the most difficult for players to conserve, is the resource of time. Of course, all games require an investment of time, but in most games, that investment comes in the form of active participation from players. To level up, you may need to actively seek out and destroy enemies. To increase your resource pool, create more buildings or dispatch more serfs. 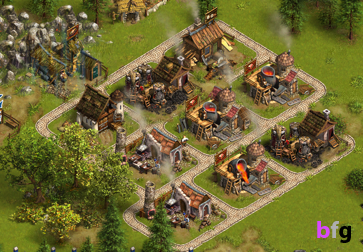 Settlers, however, demands that players spend a great deal of time being idle. Raising an army takes hours, if not days, and during that time, there's little players can do except for wait for orders to be completed. The game was clearly built to be played over a period months, if not years. While that kind of commitment from players is certainly not unheard of, it seems like it's asking quite a lot build that expectation into the game from the start. But that's exactly what Settlers does. A recently added building type, the Gem Pit, exemplifies Ubisoft Blue Byte's expectations about player commitment all too well. The building costs 20,000 gems to purchase (roughly $83), and will yield 40,000 gems over six months. Six months! You won't even start to see a profit from your hefty monetary investment until at least three months have past. I know of no other game that expects such a lengthy and devoted relationship from its players. This game was recommended for having a number of educational elements lurking silently under its fun-to-play exterior, although it was not obvious to me at first in what way this was true. 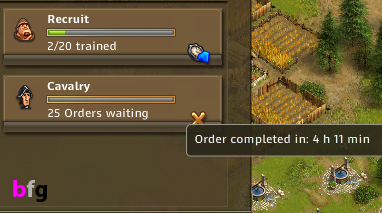 I thought perhaps the game was supposed to be historical and that it taught something about historical supply chains. For example, you need copper mines to make tools and swords. But you also need to refine that copper ore into bronze first, which requires copper smelters. And copper smelters don't simply run on air, they need fuel. This means you either have to mine some coal, or burn wood to make coke. Although supply chains are a common feature of many modern real-time strategy games, the complexity of these chains in Settlers struck me as a bit unique. However, I eventually came to realize that it's not the realism of the supply chain that adds the educational dimension, it's the ratios. A denuded forest bears witness to an unbalanced economy. In The Settlers Online, almost none of the goods that you either create or harvest work with one another in happy one-to-one ratios. Even the very first goods that you harvest in the game, raw lumber, can prove extremely tricky to properly balance. On the surface, lumber harvesting seems quite simple: build fir wood cutters, get fir wood. However, building cutters alone will deforest your woods and your cutters will have to travel farther and farther away from their workshop to find resources. If you want to harvest lumber succesfully, you need to also construct fir wood foresters to replace the lumber being taken. But there's a catch: cutters take at least 1 min and 30 seconds to complete a harvesting cycle. Foresters take 2 mins and 15 seconds to complete their planting cycle. 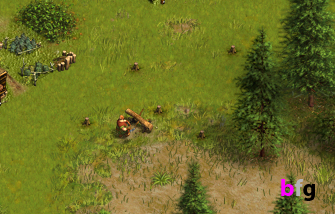 Players who naively build one forester for every one wood cutter will soon find their woods looking woefully depleted. This unique limitation on how quickly resources of any particular type can be produced makes for a great deal of complexity in the local economy. Add in the fact that time will also vary depending on where production houses are placed with respect to storehouses and it becomes apparent that a player could spend hours trying to calculate the optimal arrangement for a productive and balanced economy. The problem, however, is that beginning players aren't incentivized to think carefully about planning their economy in this way. In fact, you can't really think about planning your economy this way from the beginning of the game. Only a very limited number of building types are available from the start, and only one section out of nine total is available to build on. Even if players realize that building placement is important, you cannot always make the optimal arrangement in the tutorial stages, and building cannot be relocated after they have been constructed. Moving a building can only be achieved by demolishing existing buildings and re-building them anew, making redevelopment a costly enterprise. While this might arguably be a realistic approach to city planning, it doesn't encourage tinkering or optimizing production chains. Instead, most players will choose to endure poor placement choices rather than forfeit the resources they're already invested in the current infrastructure. Transport indicators are a promised feature. It's also more than a trivial task to successfully balance production chains, since the ratios are greatly complicated by building placement. To return to the earlier example of the wood cutters and foresters, we know that foresters should be placed in a 3:2 ratio to woodcutters if they are all producing goods at their fastest production rate. But those rates are theoretical bests. When buildings are actually placed, production times will vary. The three foresters you so sagely built may actually be taking 3:27, 3:07, and 3:11 to do their work, while the cutters may work at 2:22 and 2:14. Of course, this could be exactly the kind of learning experience that would make this game an interesting accessory to classroom instruction, but for the game itself, it makes planning the optimal economy practically impossible. And although changes are promised in future upgrades, you currently cannot tell when you place a building, aside from consulting outside spreadsheets like this one, what the exact production time will be. It's a little more obvious how trading goods functions as an educational experience, even those players who are not invested enough to plan out the most efficient economy. In the trade tab, players can find people exchanging goods of all kinds for a variety of other goods. There is no default currency in Settlers, although gold coins are often treated by players as the most stable tradable commodity. But even so, profiting through trade often comes from being able to recognize a non-obvious deal. Maybe a stack of 400 bronze swords usually sells for around 20 gold coins, but someone is offering a trade of 400 sausage for those swords instead. The player who understands how convert the value of goods of differing types will know which deals promise profit and which are duds. Sometimes the margins are quite narrow, so players who want to grow rich trading will soon learn to keep a calculator handy for figuring out price per item. They'll also be wise to create a ledger or other accounting system. The tools will enable them to achieve a great deal of in-game success, but they'll also leave them with some handy skills for managing their finances in the real world as well. However, the trading system has a serious downside. Currently, trading through the official trade tab only supports the exchange of resources, and the more desirable gem-purchasable goods are traded on a tacitly overlooked black market. This opens players up to an entirely different kind of educational experience--one about the hazards of trusting strangers on the internet. Gem-purchased items can be exchanged between players, but only as gifts. If a player wants to make an exchange, one player has to volunteer their end of the bargain first and hope that the other player keeps their end of the deal. As one might expect, all too often these deals go sour, and the stance of game moderators is simply "buyer beware." That the internet is full of scammers is obviously not the developer's problem to solve, and their refusal to arbitrate in the event of such black-market scams makes sense. What is frustrating about the problem, however, is that it really doesn't need to exist in the first place. Gems and gem-purchased items should be tradable, just like other resources. That they're not serves as just another irritating reminder at just how significantly the game is structured around trying to force players to purchase gems for real money. Even though The Settlers Online is a detailed and visually pleasing game with an abundance of buildings, resources, production chains, and quests for players to participate in -- usually things that are lacking in free-to-play browser games -- the truth is that Settlers is nevertheless painfully dull to play. Players spent more time waiting for things to happen (resources to be collected, troops to be trained, trades to be approved, buildings to upgrade, etc.) than they do anything else in this game. And not only to players wait to gain resources, they also wait for them to run out. Expect to spend the later levels of the game replacing exhaustible resources over and over again. As one player remarked in a forum, "this game (at level 38.5) has boiled down to doing island maintenance. Its not enjoyable, and I feel like I'm doing chores." I felt similarly, and did so long before I made it to level 38. If you value your time and your money, you should probably skip TSO. 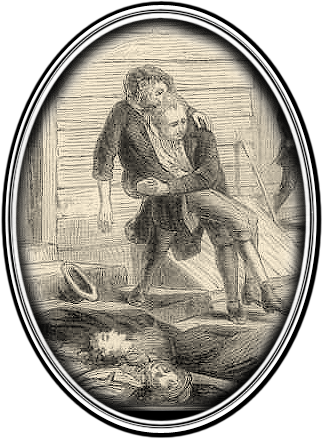 Although the game does try one's patience, there are educational elements to the game which may tickle the fancy of the detail-oriented and plan-ahead types. Supply chains are complex, and it requires careful thought in order to optimize the production of various goods. Unfortunately, a lot of the vital information players need to make good decisions about how to structure their settlement's economy and fight battles efficiently is hidden under the hood, which makes it hard for the average player to appreciate just what they should be calculating to improve their efficiency. Another complicating factor is that the slowness of the game makes it difficult to easily recognize miscalculations. An unbalanced economy deteriorates over days, not minutes or hours, and it corrects just as slowly, too. It might be somewhat realistic in this respect, but it doesn't provide a very helpful feedback mechanism for teaching players how to improve. As a fan of strategy and simulations, I would have thought I'd be a perfect audience for this game, and yet, the entire time I played TSO, I couldn't help but feel that Ubisoft Blue Byte had crippled the game in order to force players into spending real-world cash. Every aspect of the game is designed to make players wait, or to invest an exceedingly large amount of real word cash into speeding it up. But my experience playing on the test servers showed that speeding the game up only makes you realize that the waiting is the game. Once you have an abundance of resources, decisions about how to spent them are trivial. Of course, playing on the normal servers, you'll find that it will take weeks, if not months, to built up a settlement with an abundance of resources. If you've got the patience of a saint, then this may be the simulation for you. But as for me, I really wish I could reclaim the many hours of my life I spent waiting for The Settlers Online to become fun. Feel free to tell your story about why you love or hate The Settlers Online in the comments below! I agree completely with this review. I was a fan of the original Settlers games on the Amiga: they were slow-paced, but you could get things done, and the graphics were cute and cheerful. This version just takes far, far too long to be fun. Say it takes (say) a hundred hardwood planks to build a particular building: it takes six and a half minutes for my lumberjack to chop down the tree, and ten minutes for the sawmill to turn that into planks - so 16.5 minutes for every plank. So that's more than 27 hours to get enough planks to build a single building, leaving out the time added for transporting them to the storehouse, and assuming that there is no backlog in the sawmill. The problem is that you're often left just waiting, entirely unable to do anything but turn off, and log back in the next day when your resources have (you hope) built up. Moreover, there are limits on the number of buildings you can build - and, of course, to raise the limit you have to spend more money, 600 gems ($2.40 at the cheapest "deal") for every ten buildings you want a license to build. If there was a single one-pay option that would allow you unlimited buildings (and halved the amount of resources required), that might be acceptable, but this is absurd. This version has lost a lot of the charms of the earlier ones too. The animations in the first versions were cuter and funnier: the little people would do silly things, the fights were visible (and sometimes comical), and the whole look was much brighter. The people in this one are smaller and more predictable; you can't even see what's going on in fights. The simpler economy of the original versions also helped: it still had the same elements of controlling supply chains, but things moved at an appropriate speed, and there weren't too many things to take care of. This version has so many variables, it's more like work. Overall, I was glad to find my own impressions of the game confirmed by this review. It does indeed seem like an attempt to squeeze ever more money out of you. I have been pretty surprised by the positive reviews it has elsewhere - it may be a well-made, visually-appealing game, but the extreme scarcity of resources and slowness of play makes it indistinguishable from chores. I'm happy to hear that my review matched with your experience with this game. I'm starting to think that this might just be the kind of game that you either love or hate, but it unfortunately takes you about 20+ hours of play time to figure out exactly which type of person you are.